« GSM – Gone So Much … or is it? is how the Kauffman Foundations starts their extensive report on investments in Venture Capital Funds and their abysmal poor performance over the last 20 years. Only 20 out of 200 Venture Funds generated returns that beat the public-market equivalent with more than 3%. 10 of those were Funds created prior to 1995. Clearly there is something rotten in the state of valuation, value creation and management. Is this state of affairs limited only to portfolio management (i..e, one might have hoped a better diversified VC portfolio) is this poor track record on investment decisions (even diversified portfolios) generic to any investment decision made in any business? I let smarter people answer this question. Though there is little doubt in my mind that the quote “We have met the Enemy … and he is us” could apply to most corporations and the VC results might not be that far away from any corporation’s internal investment portfolio. Most business models and business cases will be subject to wishful thinking and a whole artillery of other biases that will tend to overemphasize the positives and under-estimate (or ignore) the negatives.The avoidance of scenario thinking and reference class forecasting will tend to bias investments towards the upper boundaries and beyond of the achievable and ignore more attractive propositions that could be more valuable than the idea that is being pursued. As I was going through my archive I stumbled over an old paper I wrote back in 2006 when I worked for T-Mobile International and Deutsche Telekom (a companion presentation due on Slideshare). At the time I was heavily engaged with Finance and Strategy in transforming Technology Investment Decision Making into a more economical responsible framework than had been the case previously. My paper was a call for more sophisticated approaches to technology investments decisions in the telecom sector as opposed to what was “standard practice” at the time and in my opinion pretty much still i. Many who are involved in techno-economical & financial analysis as well as the decision makers acting upon recommendations from their analysts are in danger of basing their decisions on flawed economical analysis or simply have no appreciation of uncertainty and risk involved. A frequent mistake made in decision making of investment options is ignoring one of the most central themes of finance & economics, the Time-Value-of-Money. An investment decision taken was insensitive to the timing of the money flow. Furthermore, investment decisions based on Naïve TCO are good examples of such insensitivity bias and can lead to highly in-efficient decision making. Naïve here implies that time and timing does not matter in the analysis and subsequent decision. “I like to get my money today rather than tomorrow, but I don’t mind paying tomorrow rather than today”. Time and timing matters when it comes to cash. Any investment decision that does not consider timing of expenses and/or income has a substantially higher likelihood of being an economical in-efficient decision. Costing the shareholders and investors (a lot of) money. As a side note Time-Value-of-Money assumes that you can actually do something with the cash today that is more valuable than waiting for it at a point in the future. Now that might work well for Homo Economicus but maybe not so for the majority of the human race (incl. Homo Financius). 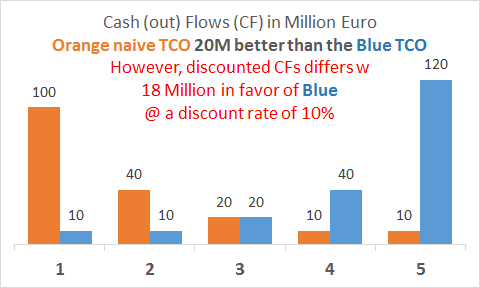 The Orange CF above amounts to a naïve TCO of €180 Million versus to the Blue’s TCO of €200 Million. Clearly if all the decision maker is presented with is the two (naïve) TCOs, he can only choose the Orange scenario and “save” €20 Million. 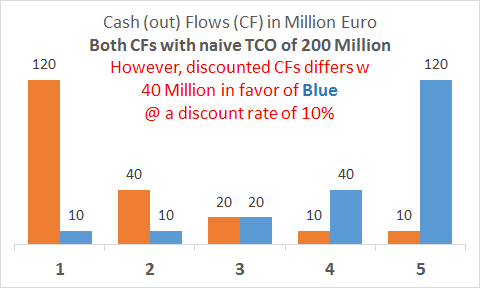 However, when time-value-of-money is considered the decision should clearly be for the Blue scenario that in terms of discounted cash flows yields €18 Million in its favor despite the TCO of €20 Million in favor of Orange. Obviously, the Blue scenario has many other advantages as opposed to Orange. When does it make sense to invest in the future? Frequently we are faced with technology investment decisions that require spending incremental cash now for a feature or functionality that we might only need at some point in the future. We believe that the cash-out today is more efficient (i.e., better value) than introducing the feature/functionality at the time when we believe it might really be needed.. Example of the value of optionality: Assuming that you have two investment options and you need to provide management with which of those two are more favorable. Product X with investment I1: provides support for 2 functionalities you need today and 1 that might be needed in the future (i.e., 3 Functionalities in total). Product Y with investment I2: provides support for the 2 functionalities you need today and 3 functionalities that you might need in the future (i.e., 5 Functionalities in total). If, in the future, we need more than 1 additional functionality it clearly make sense to ask whether it is better upfront to invest in Product Y, rather than X and then later Y (when needed). Particular when Product X would have to be de-commissioned when introducing Product Y, it is quite possible that investing in Product Y upfront is more favorable. From a naïve TCO perspective it clearly better to invest in Y than X + Y. The “naïve” analyst would claim that this saves us at least I1 (if he is really clever de-installation cost and write-offs might be included as well as saving or avoidance cost) by investing in Y upfront. Of course if it should turn out that we do not need all the extra functionality that Product Y provides (within the useful life of Product X) then we have clearly made a mistake and over-invested by and would have been better off sticking to Product X (i.e., the reference is now between investing in Product Y versus Product X upfront). Once we call upon an option, make an investment decision, other possibilities and alternatives are banished to the “land of lost opportunities”. Considering time-value-of-money (i.e., discounted cash-flows) the math would still come out more favorable for Y than X+Y, though the incremental penalty would be lower as the future investment in Product Y would be later and the investment would be discounted back to Present Value. So we should always upfront invest in the future? Categorically no we should not! Outcome 1: Product Y is not needed within lifetime T of Product X. Outcome 2: Product Y is needed within lifetime T of Product X. In our example, for Outcome 1 the NPV difference between Product X and Product Y is -10 Million US$. If we invest into Product Y and do not need all its functionality within the lifetime of Product X we would have “wasted” 10 Million US$ (i.e., opportunity cost) that could have been avoided by sticking to Product X. The value of Outcome 2 is a bit more complicated as it depends on when Product Y is required within the lifetime of Product X. Let’s assume that Product X useful lifetime is 7 years, i.e., after which period we would need to replace Product X anyway requiring a modernization investment. We assume that for the first 2 years (i.e., yr 2 and yr 3) there is no need for the additional functionality that Product Y offers (or it would be obvious to deploy up-front at least within this examples economics). From Year 4 to Year 7 there is an increased likelihood of the functionalities of Product X to be required. In Outcome 2 the blended NPV is 3.0 Million US$ positive to deploy Product X instead of Product Y and then later Product X (i.e., the X+Y scenario) when it is required. After the 7th year we would have to re-invest in a new product and the obviously looking beyond this timeline makes little sense in our simplified investment example. Finally if we assess that there is a 40% chance that the Product Y will not be required within the life-time of Product X, we have the overall effective NPV of our options would be negative (i.e., 40%(-10) + 3 = –1 Million). Thus we conclude it is better to defer the investment in Product Y than to invest in it upfront. In other words it is economical more valuable to deploy Product X within this examples assumptions. I could make an even stronger case for deferring investing in Product Y: (1) if I can re-use Product X when I introduce Product Y, (2) if I believe that the price of Product Y will be much lower in the future (i..e, due to maturity and competition), or (3) that there is a relative high likelihood that the Product Y might become obsolete before the additional functionalities are required (e.g., new superior products at lower cost compared to Product Y). The last point is often found when investing into the very first product releases (i.e., substantial immaturity) or highly innovative products just being introduced. Moreover, there might be lower-cost lower-tech options that could provide the same functionality when required that would make investing upfront in higher-tech higher-cost options un-economical. For example, a product that provide a single targeted functionality at the point in time it is needed, might be more economical than investing in a product supporting 5 functionalities (of which 3 is not required) long before it is really required. Many business cases are narrowly focusing on proving a particular point of view. Typically maximum 2 scenarios are compared directly, the old way and the proposed way. No surprise! The new proposed way of doing things will be more favorable than the old (why else do the analysis;-). While such analysis cannot be claimed to be wrong, it poses the danger of ignoring more valuable options available (but ignored by the analyst). The value of optionality and timing is ignored in most business cases. For many technology investment decisions time is more a friend than an enemy. Deferring investing into a promise of future functionality is frequently the better value-optimizing strategy. If a functionality is likely to be required beyond 36 months, the better decision is to defer the investment to later. Innovative products with no immediate use are better introduced later rather than sooner as improvement cycles and competition are going to make such more economical to introduce later (and we avoid obsolescence risk). Right timing is better than being the first (e.g., as Apple has proven a couple of times). When will the functionality be required (i.e., the earliest, most-likely and the latest). Given the timing of when it is required, what is the likelihood that something cheaper and better will be available (i.e., price-erosion, product competition, product development, etc..). As there are various uncertain elements involved in whether or not to invest in a Real Option the analysis cannot be treated as a normal deterministic discounted cash flow. The probabilistic nature of the decision analysis needs to be correctly reflected in the analysis. Most business models & cases are deterministic despite the probabilistic (i.e., uncertain and risky) nature they aim to address. Most business models & cases are 1-dimensional in the sense of only considering what the analyst tries to prove and not per se alternative options. My 2006 paper deals with such decisions and how to analyze them systematically and provide a richer and hopefully better framework for decision making subject to uncertainty (i.e., a fairly high proportion of investment decisions within technology). The typical business case analysis, based on discounted cash flows (DCF) and net-present valuation (NPV), inherently assumes that the future is known and that regardless of future events the business will follow the strategy laid down in the present. It is obvious that the future is not deterministic but highly probabilistic, and that, depending on events, a company’s strategy will be adopted to achieve maximum value out of its operation. It is important for a company to manage its investment portfolio actively and understand which strategic options generate the highest return on investment. In every technology decision our industry is faced with various embedded options, which needs to be considered together with the ever-prevalent uncertainty and risk of the real world. It is often overlooked that uncertainty creates a wealth of opportunities if the risk can be managed by mitigation and hedging. An important result concerning options is that the higher the uncertainty of the underlying asset, the more valuable could the related option become. This paper will provide the background for conventional project valuation, such as DCF and NPV. Moreover, it will be shown how a deterministic (i.e., conventional) business case easily can be made probabilistic, and what additional information can be gained with simulating the private as well as market-related uncertainties. Finally, real options analysis (ROA) will be presented as a natural extension of the conventional net-present value analysis. This paper will provide several examples of options in technology, such as radio access site-rollout strategies, product development options, and platform architectural choices. In technology, as well as in mainstream finance, business decisions are more often than not based on discounted cash flow (DCF) calculations using net-present value (NPV) as decision rationale for initiating substantial investments. Irrespective of the complexity and multitudes of assumptions made in business modeling the decision is represented by one single figure, the net present value. The NPV basically takes the future cash flows and discount these back to the present, assuming a so-called “risk –adjusted” discount rate. 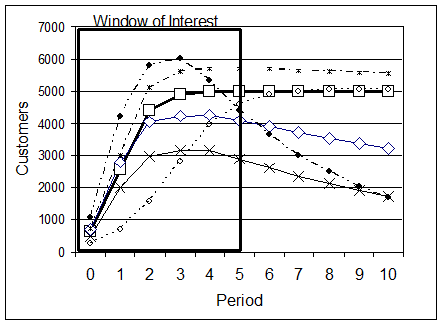 In most conventional analysis the “risk-adjusted” rate is chosen rather arbitrarily (e.g., 10%-25%) and is assumed to represent all project uncertainties and risks.The risk-adjusted rate should always as a good practice be compared with the weighted average cost of capital (WACC) and benchmarked against what Capital Asset Pricing Model (CAPM) would yield. Though in general the base rate will be set by your finance department and not per se something the analyst needs to worry too much about. Suffice to say that I am not a believer that all risk can be accounted for in the discount rate and that including risks/uncertainty into the cash flow model is essential. It is naïve to believe that the applied discount rate can account for all risk a project may face. In many respects the conventional valuation can be seen as supporting a one-dimensional decision process. DCF and NPV methodologies are commonly accepted in our industry and the finance community . However, there is a lack of understanding of how uncertainty and risk, which is part of our business, impacts the methodology in use. The bulk of business cases and plans are deterministic by design. It would be far more appropriate to work with probabilistic business models reflecting uncertainty and risk. A probabilistic business model, in the hands of the true practitioner, provides considerable insight useful for steering strategic investment initiatives. It is essential that a proper balance is found between model complexity and result transparency. With available tools, such as Palisade Corporation’s @RISK Microsoft Excel add-in software , it is very easy to convert a conventional business case into a probabilistic model. The Analyst would need to converse with subject-matter experts in order to provide a reasonable representation of relevant uncertainties, statistical distributions, and their ranges in the probabilistic business model . In this paper the word Uncertainty will be used as representing the stochastic (i.e., random) nature of the environment. Uncertainty as concept represents events and external factors, which cannot be directly controlled. The word Volatility will be used interchangeably with uncertainty. With Risk is meant the exposure to uncertainty, e.g., uncertain cash-flows resulting in out-of-money and catastrophic business failure. The total risk is determined by the collection of uncertain events and Management’s ability to deal with these uncertainties through mitigation and “luck”. Moreover, the words Option and Choice will also be used interchangeably throughout this paper. Luck is something that never should be underestimated. While working on the T-Mobile NL business case for the implementation of Wireless Application Protocol (WAP) for circuit switched data (CSD), a case was presented showing a 10% chance of losing money (over a 3 year period). The business case also showed an expected NPV of €10 Million, as well as a 10% chance of making more than €20 Million over a 3 year period. The spread in the NPV, due to identified uncertainties, were graphically visualized. Management, however, requested only to be presented with the “normal” business case NPV as this “was what they could make a decision upon”. It is worthwhile to understand that the presenters made the mistake to make the presentation to Management too probabilistic and mathematical which in retrospect was a wrong approach . Furthermore, as WAP was seen as something strategically important for long-term business survival, moving towards mobile data, it is not conceivable that Management would have turned down WAP even if the business case had been negative. Defer/delay until market conditions became more certain. Defer/delay until GPRS became available. Outsource service with option to in-source or terminate depending on market conditions and service uptake. Defer/delay until technology becomes more mature, etc..
As a Decision is made, future cash flow streams are assumed fixed. There is no flexibility as soon as a decision has been made, and the project will be “passively” managed. Cash-flow uncertainty is not considered, other than working with a risk-adjusted discount rate. The discount rate is often arbitrarily chosen (between 9%-25%) reflecting the analyst’s subjective perception of risk (and uncertainty) with the logic being the higher the discount rate the higher the anticipated risk (note: the applied rate should be reasonably consistent with Weighted Average Cost of Capital and Capital Asset Pricing Model (CAPM)). The discount rate remains constant over the life-time of the project (i.e., which is naïve). There is no consideration of the value of flexibility, choices and different options. Strategic value is rarely incorporated into the analysis. It is well known that many important benefits are difficult (but not impossible) to value in a quantifiable sense, such as intangible assets or strategic positions. If a strategy cannot be valued or quantified it should not be pursued. Different project outcomes and the associated expected NPVs are rarely considered. Cash-flows and investments are discounted with a single discount rate assuming that market risk and private (company) risk is identical. Correct accounting should use the risk-free rate for private risk and cash-flows subject to market risks should make use of market risk-adjusted discount rate. In the following several valuation methodologies will be introduced, which build upon and extend the conventional discounted cash flow and net-present value analysis, providing more powerful means for decision and strategic thinking. T is the period during which the valuation is considered, Ct is the future cash flow at time t, rram is the risk-adjusted discount rate applied to market-related risk, It is the investment cost at time t, and rrap is the risk-adjusted-discount rate applied to private-related risk. In most analysis it is customary to assume the same discount rate for private as well as market risk as it simplifies the valuation analysis. The “effective” discount rate r* is often arbitrarily chosen. The I0 is the initial investment at time t=0, and Ct* = Ct – It (for t>0) is the difference between future cash flows and investment costs. The approximation (i.e., ≈ sign) only holds in the limit where the rate rrap is close to rram. The private risk-adjusted rate is expected to be lower than the market risk-adjusted rate. Therefore, any future investments and operating costs will weight more than the future cash flows. Eventually value will be destroyed unless value growth can be achieved. It is therefore important to manage incurred cost, and at the same time explore growth aggressively (at minimum cost) over the project period. Assuming a risk-adjusted or effective rate for both market and private risk investment, cost and cash-flows could lead to a even serious over-estimation of a given project’s value. In general, the private risk-adjusted rate rrap would be between the risk-free rate and the market risk-adjusted discount rate rram. EXAMPLE 1: An initial network investment of 20 mio euro needs to be committed to provide a new service for the customer base. It is assumed that sustenance investment per year amounts to 2% of the initial investment and that operations & maintenance is 20% of the accumulated investment (50% in initial year). Other network cost, such as transmission (assumes centralized platform solution) increases with 10% per year due to increased traffic with an initial cost of €150 thousand. The total network investment and cost structure should be discounted according with the risk-free rate (assumed to be 5%). Market assumptions: s-curve consistent growth assumed with a saturation of 5 Million service users after approximately 3 years. It has been assumed that the user pays 0.8 euro per month for the service and that the service price decreases with 10% per year. Cost of acquisition assumed to be 1 euro per customer, increasing with 5% per year. Other market dependent cost assumed initially to be €400 thousand and to increase with 10% per year. It is assumed that the project is terminated after 5 years and that the terminal value amounts to 0 euro. PV stands for present value and FV for future value. The PV has been discounted back to year 0. It can be seen from the table that the project breaks-even after 3 years. The first analysis presents the NPV results (over a 5 year period) when differentiating between private (private risk-adjusted rate) and market (market risk-adjusted rate) risk taking, a positive NPV of €26M is found. This should be compared with the standard approach assuming an effective rate of 12.5%, which (not surprisingly) results in a positive NPV of €46M. The difference between the two approaches amounts to about €19M. NPV = €46M using an effective discount rate (e.g., difference of €20M assuming the following discount rates rram = 20%, rrap =5%, r* = 12.5%). Obviously, as rram –> r* and rrap –> r* , the difference in the two valuation approaches will tend to zero. The traditional valuation methodology presented in the previous section makes no attempt to incorporate uncertainties and risk other than the effective discount-rate r* or risk-adjusted rates rram/rap. It is inherent in the analysis that cash-flows, as well as the future investments and cost structure, are assumed to be certain. The first level of incorporating uncertainty into the investment analysis would be to define market scenarios with an estimated (subjective) chance of occurring. A good introduction to uncertainty and risk modeling is provided in the well-written book by D. Vose , S.O. Sugiyama’s training notes  and S. Beninga’s “Financial Modeling” . 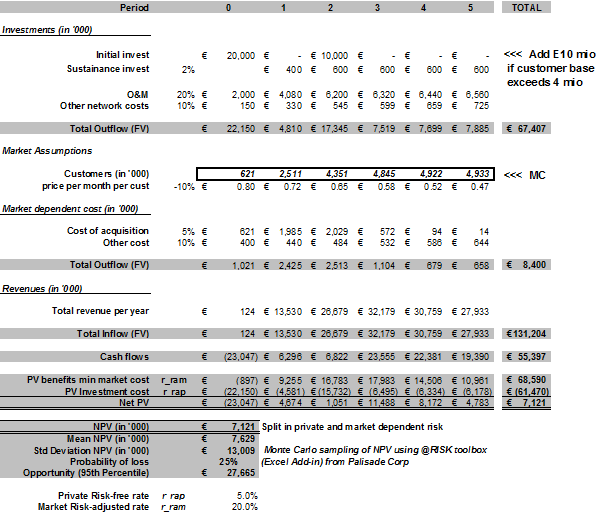 The Business Analyst working on the service introduction, presented in Example 1, assesses that there are 3 main NPV outcomes for the business model; NPV1= 45, NPV2= 20 and NPV3= -30. The outcomes have been based on 3 different market assumptions related to customer uptake: 1. Optimistic, 2. Base and 3. Pessimistic. The NPVs are associated with the following chances of occurrence: P1 = 25%, P2 = 50% and P3 = 25%. What would the expected net-present value be given the above scenarios? The expected NPV (ENPV) would be ENPV=P1×NPV1+ P2×NPV2+ P3×NPV3=25%×45+50%×20+25%×(-30) =14. Example 2 (below) illustrates the process of obtaining the expected NPV. 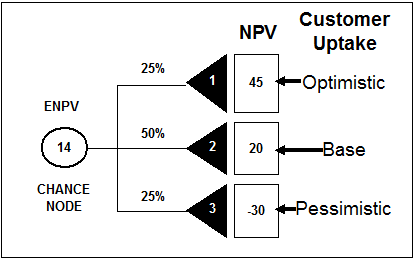 Example 2: illustrates how to calculate the expected NPV (ENPV) when 3 NPV outcomes have been identified resulting from 3 different customer uptake scenarios. 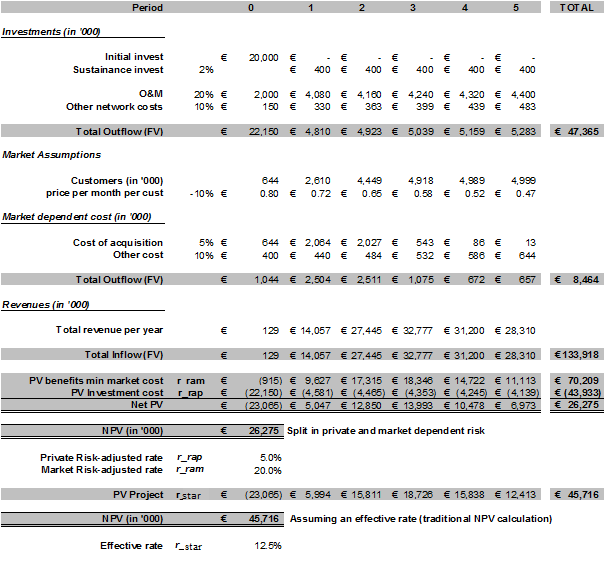 The expected NPV calculation assumes that we do not have any flexibility to avoid any of the 3 outcomes. The circular node represents a chance node yielding the expected outcome given the weighted NPVs. ,where N is number of possible NPV outcomes, NPVi is the net present value of the ith outcome and Pi is the chance that the ith outcome will occur. By including scenarios in the valuation analysis, the uncertainty of the real world is being captured. The risk of overestimating or underestimating a project valuation is thereby minimized. Typically, the estimation of P, which is the chance or probability, for a particular outcome is based on subjective “feeling” of the Business Analyst, who obviously still need to build a credible story around his choices of likelihood for the scenarios in questions. Clearly this is not a very satisfactory situation as all kind of heuristic biases are likely to influence the choice of a given scenarios likelihood. Still it is clearly more realistic than a purely deterministic approach with only one locked-in happening. Example 3 shows various market outcomes used to study the uncertainty of market conditions upon the net-present value of Example 1and the project valuation subject these uncertainties. The curve represented by the thick solid line and open squares is the base market scenario used in Example 1, while the other curves represent variations to the base case. Various uncertainties of the customer growth have been explored. An s-curve (logistic function) approach has been used to model the customer uptake of for the studied service: , t is time period, Smax is the maximum expected number of customer, be determines the slope in the growth phase, and (1/a) is the years to reach the mid-point of the S-curve. The function models the possible decline in customer base, with c being the rate of decline in the market share, and td the period when the decline sets in. Smax has been varied between 2.5 and 6.25 Million customers, with an average of 5.0 Million, b was chosen to be 50 (arbitrarily), (1/a) was varied between 1/3 and 2 (year), with a mean of 0.5 (year). In modeling the market decline, the rate of decline c was varied between 0% and 25% years, with a chosen mean value of 10%, and the td was varied between 0 and 3 years with a mean of 2 years before market decline starts. In all cases a so-called pert distribution was used to model the parameter variance. Instead of running a limited number of scenarios as shown in Example 2 (3 outcomes), a Monte Carlo (MC) simulation is carried out sampling several thousands of possible outcomes. As already discussed a valuation analysis often involves many uncertain variables and assumptions. In the above Example 3 different NPV scenarios had been identified, which resulted from studying the customer uptake. Typically, the identified uncertain input variables in a simplified scenario-sensitivity approach would each have at least three possible values; minimum (x), base-line or most-likely (y), and maximum (z). For every uncertain input variable the Analyst has identified a variation, i.e., 3 possible variations. For an analysis with 2 uncertain input variables, each with variation, it is not difficult to show that the outcome is 9 different scenario-combinations, for 3 uncertain input variables the result is 72 scenario-combinations, 4 uncertain input variables results in 479 different scenario permutations, and so forth. In complex models containing 10 or more uncertain input variables, the number of combinations would have exceeded 30 Million permutations . Clearly, if 1 or 2 uncertain input variables have been identified in a model the above presented scenario-sensitivity approach is practical. However, the range of possibilities quickly becomes very large and the simple analysis breaks down. In these situations the Business Analyst should turn to Monte Carlo  simulations, where a great number of outcomes and combinations can be sampled in a probabilistic manner and enables proper statistical analysis. Before the Analyst can perform an actual Monte Carlo simulation, a probability density function (pdf) needs to be assigned to each identified uncertain input variable and any correlation between model variables needs to be addressed. It should be emphasized that with the help of subject-matter experts, an experienced Analyst in most cases can identify the proper pdf to use for each uncertain input variable. A tool such as Palisade Corporation’s @RISK toolbox  for MS Excel visualizes, supports and greatly simplifies the process of including uncertainty into a deterministic model, and efficiently performs Monte Carlo simulations in Microsoft Excel. Rather than guessing a given scenarios likelihood, it is preferable to transform the deterministic scenarios into one probabilistic scenario. Substituting important scalars (or drivers) with best practice probability distributions and introduce logical switches that mimic choices or options inherent in different driver outcomes. Statistical sampling across simulated outcomes will provide an effective (or blended) real option value. In Example 1a standard deterministic valuation analysis was performed for a new service and the corresponding network investments. The inherent assumption was that all future cash-flows as well as cost-structures were known. The analysis yielded a 5-year NPV of 26 mio (using the market-private discount rates). This can be regarded as a pure deterministic outcome. The Business Analyst is requested by Management to study the impact on the project valuation incorporating uncertainties into the business model. Thus, the deterministic business model should be translated into a probabilistic model. It is quickly identified that the market assumptions, the customer intake, is an area which needs more analysis. Example 3shows various possible market outcomes. The reference market model is represented by the thick-solid line and open squares. The market outcome is linked to the business model (cash-flows, cost and net-present value). The deterministic model in Example 1 has now been transformed into a probabilistic model including market uncertainty. Example 4: shows the impact of uncertainty in the marketing forecast of customer growth on the Net Present Value (extending Example 1). A Monte Carlo (MC) simulation was carried out subject to the variations of the market conditions (framed box with MC in right side) described above (Example 2) and the NPV results were sampled. As can be seen in the figure above an expected mean NPV of €22M was found with a standard deviation of €16M. Further, analysis reveals a 10% probability of loss (i.e., NPV £ 0 euro) and an opportunity of up to €46M. Charts below (Example 4b and 4c) show the NPV probability density function and integral (probability), respectively. Example 4 above summarizes the result of carrying out a Monte Carlo (MC) simulation, using @RISK , determining the risks and opportunities of the proposed service and therefore obtaining a better foundation for decision making. In the previous examples the net-present value was represented as a single number; €26M in Example 1 and an expect NPV of €14M in Example 2. 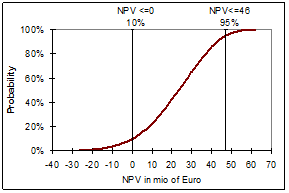 In Example 4, the NPV is far richer (see the probability charts of NPV at the bottom of the page) – first note that the mean NPV of €22M agree well with Example 1. Moreover, the Monte Carlo analysis shows the project down-side, that there is a 10% chance of ending up with a poor investment, resulting in value destruction. The opportunity or upside is a chance (i.e., 5%) of gaining more than €46M within a 5-year time-horizon. The project risk profile is represented with the NPV standard deviation, i.e. the project volatility, of €16M. It is Management’s responsibility to weight the risk, downside as well as upside, and ensure that proper mitigation will be considered to reduce the impact of the project downside and potential value destruction. The presented valuation methodologies so far do not consider flexibility in decision making. Once an investment decision has been taken investment management is assumed to be passive. Thus, should a project turn out to destroy value, which is inevitable if revenue growth becomes limited compared to the operating cost, Management is assumed not to terminate or abandon this project. In reality active Investment Management and Management Decision Making does consider options and their economical and strategic value. In the following a detailed discussion on the valuation of options and the impact on decision making are presented. The Real options analysis (ROA) will be introduced as a natural extension of probabilistic cash flow and net present value analysis. It should be emphasized that ROA is based on some advanced mathematical, as well as statistical concepts, which will not be addressed in this work. However, it is possible to get started on ROA with proper re-arrangement of the conventional valuation analysis, as well as incorporating uncertainty where ever appropriate. In the following the goal is to get the reader introduced to thinking about the value of options. An investment option can be seen as a decision flexibility, which depending upon uncertain conditions, might be realized. It should be emphasized, that as with a financial option, it is at the investor’s discretion to realize an option. Any cost or investment for the option itself can be viewed as the premium a company has to pay in order to obtain the option. For example, a company could be looking at an initial technology investment, with the option later on to expand should market conditions be favorable for value growth. Exercising the option, or making the decision to expand the capacity, results in a commitment of additional cost and capital investments – the “strike price” – into realizing the plan/option. Once the option to expand has been exercised, the expected revenue stream becomes the additional value subject to private and market risks. In every technology decision a decision-maker is faced with various options and would need to consider the ever-prevalent uncertainty and risk of real-world decisions. In the following example, a multinational company is valuing a new service with the idea to commercially launch in all its operations. The cash-flows, associated with the service, are regarded as highly uncertain, and involve significant upfront development cost and investments in infrastructure to support the service. The company studying the service is faced with several options for the initial investment as well as future development of the service. Firstly, the company needs to make the decision to launch the service in all countries in which it is based, or to start-up in one or a few countries to test the service idea before committing to a full international deployment, investing in transport and service capacity. The company also needs to evaluate the architectural options in terms of platform centralization versus de-centralization, platform supplier harmonization or commit to a more-than-one-supplier strategy. In the following, options will be discussed in relation to the service deployment as well as the platform deployment, which supports the new service. In the first instance the Marketing strategy defines a base-line scenario in which the service is launched in all its operations at the same time. The base-line architectural choice is represented by a centralized platform scenario placed in one country, providing the service and initial capacity to the whole group. Platform centralization provides for an efficient investment and resourcing; instead of several national platform implementation projects only one country focuses its resources. However, the operating costs might be higher due to need for international leased transmission connectivity to the centralized platform. Due to the uncertainty in the assumed cash-flows, arising from market uncertainties, the following strategy has been identified; The service will be launched initially in a limited number of operations (one or two) with the option to expand should the service be successful (option 1), or should the service fail to generate revenue and growth potential an option to abandon the service after 2 years (option 2). The valuation of the identified options should be assessed in comparison with the base-line scenario of launching the service in all operations. It is clear that the expansion option (option 1) leads to a range of options in terms of platform expansion strategies depending on the traffic volume and cost of the leased international transmission (carrying the traffic) to the centralized platform. For example, if the cost of transmission exceeds the cost of operating the service platform locally an option to locally deploy the service platform is created. From this example it can be seen that by breaking up the investment decisions into strategic options the company has ensured that it can abandon should the service fail to generate the expected revenue or cash-flows, reducing loses and destruction of wealth. However, more importantly the company, while protecting itself from the downside, has left open the option to expand at the cost of the initial investment. It is evident that as the new service has been launched and cash-flows start being generated (or lack of appropriate cash-flows) the company gains more certainty and better grounds for making decisions on which strategic options should be exercised. In the previous example, an investment and its associated valuation could be related to the choices which come naturally out of the collection of uncertainties and the resulting risk. In the literature (e.g., , ) it has been shown that conventional cash-flow analysis, which omits option valuation, tends to under-estimate the project value . The additional project value results from identifying inherent options and valuing these options separately as strategic choices that can be made in a given time-horizon relevant to the project. The consideration of the value of options in the physical world closely relates to financial options theory and treatment of financial securities . The financial options analysis relates to the valuation of derivatives  depending on financial assets, whereas the analysis described above identifying options related to physical or real assets, such as investment in tangible projects, is defined as real options analysis (ROA). Real options analysis is a fairly new development in project valuation (see , , , , , and ), and has been adopted to gain a better understanding of the value of flexibility of choice. It is instructive to consider a number of examples of options/flexibilities which are representative for the mobile telecommunications industry. Real options or options on physical assets can be divided in to two basic types – calls and puts. A call option gives, the holder of the option, the right to buy an asset, and a put option provides the holder with the right to sell the underlying asset. First, the call option will be illustrated with a few examples: One of the most important options open to management is the option to Defer or Delay (1) a project. This is a call option, right to buy, on the value of the project. The defer/delay option will be addressed at length later in this paper. The choice to Expand (2) is an option to invest in additional capacity and increase the offered output if conditions are favorable. This is defined as a call option, i.e., the right to buy or invest, on the value of the additional capacity that could enable extra customers, minutes-of-use, and of course additional revenue. The exercise price of the call option is the investment and additional cost of providing the additional capacity discounted to the time of the option exercise. A good example is the expansion of a mobile switching infrastructure to accommodate an increase in the customer base. Another example of expansion could be moving from platform centralization to de-centralization as traffic grows and the cost of centralization becomes higher than the cost of decentralizing a platform. For example, the cost of transporting traffic to a centralized platform location could, depending on cost-structure and traffic volume, become un-economical. Moreover, Management is often faced with the option to extend the life of an asset by re-investing in renewal – this choice is a so-called Replacement Option (3). This is a call option, the right to re-invest, on the assets future value. An example could be the renewal of the GSM base-transceiver stations (BTS), which would extend the life and adding additional revenue streams in the form of options to offer new services and products not possible on the older equipment. Furthermore, there might be additional value in reducing operational cost of old equipment, which typically would have higher running cost, than with new equipment. Terminate/Abandonment (5) in a project is an option to either sell or terminate a project. It is a so-called put option, i.e., it gives the holder the right to sell, on the projects value. The strike price would be the termination value of the project reduced by any closing-down costs. This option mitigates the impact of a poor investment outcome and increases the valuation of the project. A concrete example could be the option to terminate poorly revenue generating services or products, or abandon a technology where the operating costs results in value destruction. The growth in cash-flows cannot compensate the operating costs. Contraction choices (6) are options to reduce the scale of a project’s operation. This is a put option, right to “sell”, on the value of the lost capacity. The exercise price is the present value of future cost and investments saved as seen at the time of exercising the option. In reality most real investment projects can be broken up in several phases and therefore also will consist of several options and the proper investment and decision strategy will depend on the combination these options. Phased or sequential investment strategies often include Compounded Options (8), which are a series of options arising sequentially. Going back to Example 1 and Example 4, the platform subject-matter expert (often different from the Analyst) has identified that if the customer base exceeds 4 Million customers and expansion of €10M will be needed. Thus, the previous examples underestimate the potential investments in platform expansion due to customer growth. Given that the base-line market scenario does identify that that this would be the case in the 2nd year of the project the €10M is included in the deterministic conventional business case for the new service. The result of including the €10M in the 2nd year of Example 1 is that the NPV drops from €26M to €8.7M (∆NPV minus €17.6M). Obviously, the conventional Analyst would stop here and still be satisfied that this seems to be a good and solid business case. The approach of Example 4 is applied to the new situation, subject to the same market uncertainty given in Example 3. 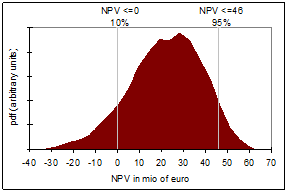 From the Monte Carlo simulation, it is found that the NPV mean-value only is €4.7M. However, the downside is that the probability of loss (i.e., an NPV less than 0) now is 38%. It is important to realize that in both examples is the assumption that there is no choice or flexibility concerning the €10M investment; the investment will be committed in year two. However, the project has an option – the option to expand provided that the customer base exceeds 4 Million customers. Time wise it is a flexible option in the sense that if the project expected lifetime is 5 years, any time within this time-horizon is there a possibility that the customer base exceeds the critical mass for platform expansion. Example 5: Shows the NPV valuation outcome when an option to expand is included in the model of Example 4. The €10M is added if and only if the customer base exceeds 4 Million. In the above Example 5 the probabilistic model has been changed to add €10M if and only if the customer base exceeds 4 Million. Basically, the option of expansion is being simulated. Treating the expansion as an option is clearly valuable for the business case, as the NPV mean-value has increased from €4.7M to €7.6M. In principle the option value could be taken to €2.9M. It is worthwhile noticing that the probability of loss (from 38% to 25%) has also been reduced by allowing for the option not to expand the platform if the customer base target is not achieved. It should be noted that although the example does illustrate the idea of options and flexibility it is not completely in line with a proper real options analysis. 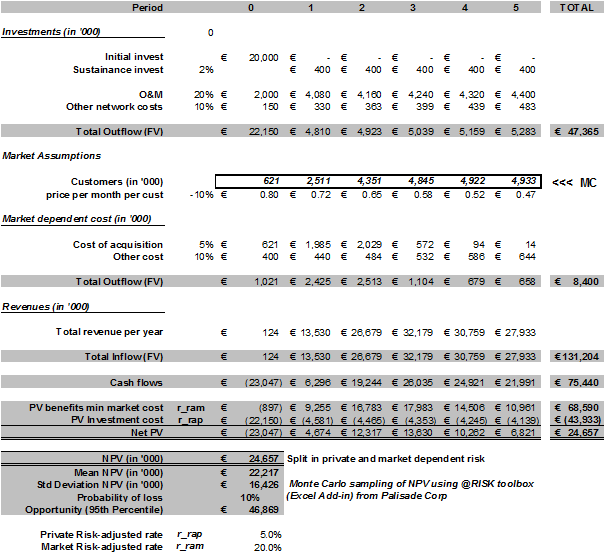 Example 6 Shows the different valuation outcomes depending on whether the €10M platform expansion (when customer base exceeds 4 Million) is considered as un-avoidable (i.e., the “Deterministic No Option” and “Probabilistic No Option”) or as an option or choice to do so (“Probabilistic with Option”). It should be noted that the additional €3M in difference between “Probabilistic No Option” and “Probabilistic With Option” can be regarded as an effective option value, but it does not necessarily agree with a proper real-option valuation analysis of the option to expand. Another difference in the two probabilistic models is that in the model with option to expand an expansion can happen any year if customer base exceeds 4 Million, while the No option model only considers the expansion in year 2 where according with the marketing forecast the base exceeds the 4 Million. Note that Example 6 is different in assumptions than Example 1 and Example 4 as these do not include the additional €10M. Example 6 above summarizes the three different approaches of valuation analysis; deterministic (essential 1-dimensional), probabilistic with options, and probabilistic including value options. The investment analysis of real options as presented in this paper is not a revolution but rather an evolution of the conventional cash-flow and NPV analysis. The approach to valuation is first to understand and proper model the base-line case. After the conventional analysis has been carried out, the analyst, together with subject-matter experts, should determine areas of uncertainty by identifying the most relevant uncertain input parameters and their variation-ranges. As described in the previous section the deterministic business model is being transformed into a probabilistic model. The valuation range, or NPV probability distribution, is obtained by Monte Carlo simulations and the opportunity and risk profile is analyzed. The NPV opportunity-risk profile will identify the need for mitigation strategies, which in itself result in studying the various options inherent in the project. The next step in the valuation analysis is to value the identified project or real options. The qualitatively importance of considering real options in investment decisions has been provided in this paper. It has been shown that conventional investment analysis, represented by net-present value and discounted cash-flow analysis, gives only one side of the valuation analysis. As uncertainty is the “farther” of opportunity and risk it needs to be considered in the valuation process. Are identified options always valuable? The answer to that question is no – if we have certainty about an option movement is not in our favor then the option would be valuable. Think for example of considering a growth option at the onset of severe recession. due to the involvement of the partial differential equations (PDE) that describes the underlying uncertainty (continuous-time stochastic processes, involvement of Markov processes, diffusion processes, and so forth). Studying PDEs are the basis for the ground-breaking work of the Black-Scholes-Merton   on option pricing, which provided the financial community with an analytical expression for valuing financial options. However, “heavy” mathematical analysis is not really needed for getting started on real option. Real options are a way of thinking, identifying valuable options in a project or potential investment that could create even more value by considering as an option instead of a deterministic given. Furthermore, Cox et al  proposed a simplified algebraic approach, which involves so-called binominal trees representing price, cash-flow, or value movements in time. The binomial approach is very easy to understand and implement, resembling standard decision tree analysis, and visually easy to generate, as well as algebraically straightforward to solve. Real options are everywhere where uncertainty governs investment decisions. It should be clear that uncertainty can be turned into a great advantage for value growth providing proper contingencies are taken for reducing the downside of uncertainty – mitigating risk. Very few investment decisions are static, as conventional discounted cash-flow analysis otherwise might indicate, but are ever changing due to changes in market conditions (global as well as local), technologies, cultural trends, etc. In order to continue to create wealth and value for the company value growth is needed and should force a dynamic investment management process that continuously looks at the existing as well as future valuable options available for the industry. It is compelling to say that a company’s value should be related to its real-options portfolio, and its track record in mitigating risk, and achieving the uncertain up-side of opportunities. I am indebted to Sam Sugiyama (President & Founder of EC Risk USA & Europe) for taking time out from a very busy schedule and having a detailed look at the content of our paper. His insights and hard questions have greatly enriched this work. Moreover, I would also like to thank Maurice Ketel (Manager Network Economics), Jim Burke (who in 2006 was Head of T-Mobile Technology Office) and Norbert Matthes (who in 2007 was Head of Network Economics T-Mobile Deutschland) for their interest and very valuable comments and suggestions. APPENDIX – MATHEMATICS OF VALUE. If r* is positive time-value-of-money follows naturally, i.e., money received in the future is worth less than today. It is a fundamental assumption that you can create more value with your money today than waiting to get them in the future (i.e., not per se right for majority of human beings but maybe for Homo Economicus). First the sequence of future money value (discounted to the present) has the structure of a geometric series: , with yk+1 = g*yk (i.e., g* representing the change in y between two periods k and k+1). Define and note that , thus in this framework we have that (note: I am doing all kind of “naughty” simplifications to not get too much trouble with the math).
. In the limit where n goes toward infinity (¥), providing that , it can be seen that . It is often forgotten that this only is correct if and only if or in other words, if the discount rate (to present value) is higher than the future value growth rate. You might often hear you finance folks (or M&A jockeys) talk about Terminal Value (they might also call it continuation value or horizon value … for many years I called it Termination Value … though that’s of course slightly out of synch with Homo Financius not to be mistaken for Homo Economicus :-). NPV representing the net present value as calculated over a well-defined time span T.
I always found the Terminal Value fascinating as the size (matters?) or relative magnitude can be very substantial and frequently far greater than the NPV in terms of “value contribution” to the present value. Of course we do assume that our business model will survive to “Kingdom Come”. Appears to be a slightly optimistic assumptions (n’est pas mes amis? :-). We also assume that everything in the future is defined by the last year of cash-flow, the cash flow growth rate and our discount rate (hmmm don’t say that Homo Financius isn’t optimistic). Mathematically this is all okay (if ), economically maybe not so. I have had many and intense debates with past finance colleagues about the validity of Terminal Value. However, to date it remains a fairly standard practice to joggle up the enterprise value of a business model with a “bit” of Terminal Value. It is easy to see why TV can be a very substantial contribution to the total value of a business model. The denominator (r-g) tends to be a lot smaller than 1 (i.e., note that always we have g<r) and though “blows” up the TV contribution to the present value (even when g is chosen to be zero). Let’s take a numerical example, y=1, the interest rate x = 10% and the uncertainty/error is assumed to be no more than ∆x=3% (7%£ x £13%), assume that n®¥ (infinite time-horizon). Using the formula derived above NPV¥=11 and ∆NPV¥=±3.30 or a 30% error on estimated NPV. If the assumed cash-flows (i.e., yk) also uncertain the error will even be greater than 30%. The above analysis becomes more complex when yk is non-constant over time k and as yk to should be regarded as uncertain. The use of for example Microsoft Excel becomes rather useful to gain further insight (although the math is pretty fun too). This is likely due to the widespread use of MS Excel and financial pocket calculators allowing for easy NPV calculations, without the necessity for the user to understand the underlying mathematics, treating the formula as “black” box calculation. Note a common mistake using MS Excel NPV function is to include initial investment (t=0) in the formula – this is wrong the NPV formula starts with t=1. Thus, initial investment would be discounted which would lead to an overestimation of value. http://www.palisade-europe.com/. For purchases contact Palisade Sales & Training, The Blue House 30, Calvin Street, London E1 6NW, United Kingdom, Tel. +442074269955, Fax +442073751229. Sugiyama, S.O., “Risk Assessment Training using The Decision Tools Suite 4.5 – A step-by-step Approach” and “Introduction to Advanced Applications for Decision Tools Suite – Training Notebook – A step-by-step Approach”, Palisade Corporation. The Training Course as well as the training material itself can be highly recommended. Most people in general not schooled in probability theory, statistics and mathematical analysis. Great care should be taken to present matters in an intuitive rather than mathematical fashion. Hill, A., “Corporate Finance”, Financial Times Pitman Publishing, London, 1998. This result comes straight from geometric series calculus. Remember a geometric series is defined as , where is constant. For the NPV geometric series it can easily be shown that , r being the interest rate. A very important property is that the series converge if , which is the case for the NPV formula when the interest rate r>1. The convergent series sums to a finite value of for k starting at 1 and summed up to ¥ (infinite). Benninga, S., “Financial Modeling”, The MIT Press, Cambridge Massachusetts (2000), pp.27 – 52. Chapter 2 describes procedures for calculating cost of capital. This book is the true practitioners guide to financial modeling in MS Excel. Vose, D., “Risk Analysis A Quantitative Guide”, (2nd edition), Wiley, New York, 2000. A very competent book on risk modeling with a lot of examples and insight into competent/correct use of probability distribution functions. The number of scenario combinations are calculated as follows: an uncertain input variable can be characterized by the following possibility set with length s, in case of k uncertain input variables the number of combinations can be calculated as , where is the COMBIN function of Microsoft Excel. A Monte Carlo simulation refers to the traditional method of sampling random (stochastic) variables in modeling. Samples are chosen completely randomly across the range of the distribution. For highly skewed or long-tailed distributions a large numbers of samples are needed for convergence. The @Risk product from Palisade Corporation (see http://www.palisade.com) supplies the perfect tool-box (Excel add-in) for converting a deterministic business model (or any other model) into a probabilistic one. Luehrman, T.A., “Investment Opportunities as Real Options: Getting Started with the Numbers”, Harvard Business Review, (July – August 1998), p.p. 3-15. Luehrman, T.A., “Strategy as a Portfolio of Real Options”, Harvard Business Review, (September-October 1998), p.p. 89-99. Providing that the business assumptions where not inflated to make the case positive in the first place. Hull, J.C., “Options, Futures, and Other Derivatives”, 5th Edition, Prentice Hall, New Jersey, 2003. This is a wonderful book, which provides the basic and advanced material for understanding options. A derivative is a financial instrument whose price depends on, or is derived from, the price of another asset. Boer, F.P., “The Valuation of Technology Business and Financial Issues in R&D”, Wiley, New York, 1999. Amram, M., and Kulatilaka, N., “Real Options Managing Strategic Investment in an Uncertain World”, Harvard Business School Press, Boston, 1999. Non-mathematical, provides a lot of good insight into real options and qualitative analysis. Copeland, T., and V. Antikarov, “Real Options: A Practitioners Guide”, Texere, New York, 2001. While the book provides a lot of insight into the area of practical implementation of Real Options, great care should be taken with the examples in this book. Most of the examples are full of numerical mistakes. Working out the examples and correcting the mistakes provides a great mean of obtaining practical experience. Munn, J.C., “Real Options Analysis”, Wiley, New York, 2002. Amram. M., “Value Sweep Mapping Corporate Growth Opportunities”, Harvard Business School Press, Boston, 2002. Boer, F.P., “The Real Options Solution Finding Total Value in a High-Risk World”, Wiley, New York, 2002.
] Black, F., and Scholes, M., “The Pricing of Options and Corporate Liabilities”, Journal of Political Economy, 81 (May/June 1973), pp. 637-659. Merton, J.C., “Theory of Rational Option Pricing”, Bell Journal of Economics and Management Science, 4 (Spring 1973), 141-183. Cox, J.C., Ross, S.A., and Rubinstein, M., “Option Pricing: A Simplified Approach”, Journal of Financial Economics, 7 (October 1979) pp. 229-63. This entry was posted on March 16, 2014, 5:11 am and is filed under Business Modeling, Economics, Finance, Mobile Telecoms, Strategy, Technology. You can follow any responses to this entry through RSS 2.0. You can leave a response, or trackback from your own site.